Cast Iron beds first became popular in the 1800s. People loved them because they were strong, kept bedding clean, and were easy to use. In addition, they were a better option to sleeping on the ground. Their popularity has not waned since then. They are a common feature in many homes and add a unique touch that is hard to miss. 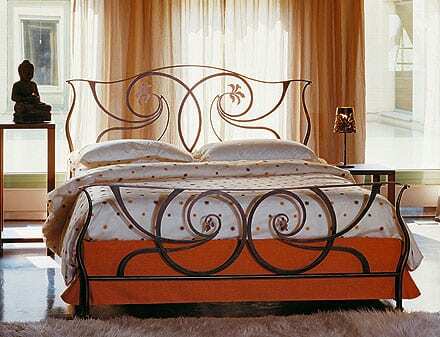 The Samoa Cast Iron Bed from Galbiati Fratelli is a modern take on cast iron beds. It has smooth, gentle curves and features lovely designs on its headboard and footboard. Equally at home in both traditional and modern settings, the Samoa Cast Iron Bed from Galbiati Fratelli is a stylish piece. It has a gorgeous iron frame and will quickly become one of your prized possessions. Its classic shape and timeless appeal make it a perfect fit for any décor. The bed packs a big style punch and will improve the look of any room. Pair it with luxurious linens and fluffy duvets for the ultimate look or add rich silks and velvets to set the perfect mood. The sensuous, curvy metal bed exudes magnificence and will make you look forward to bedtime. No matter your lifestyle, rest is essential. Get the Samoa Cast Iron Bed for your bedroom and forget about sleepless nights. Tossing and turning will be a thing of the past. This will ensure you get a good night’s rest and wake up feeling refreshed. It is not only practical; it perfectly matches your personality. Are you captivated by the Samoa Cast Iron Bed?